Traditionally the Phanouropita is baked on the feast of Saint Phanourios on August 27th, at which time it is brought to church for a blessing either the evening before during Vespers or on the day of the feast during the Divine Liturgy. This is done to thank the Saint for whatever miracle he has done for us, most commonly in helping us to find lost items and for single people looking for a spouse. The Phanouropita can be baked any time of the year as well. There is also a tradition that says the mother of Saint Phanourios was a hard-hearted and sinful woman who died unrepentant. 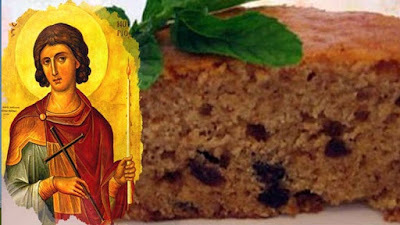 Therefore, the Phanouropita is also baked on behalf of the mother of Saint Phanourios, to pray for her forgiveness. Alexandros Papadiamantis writes that whoever invokes the aid of Saint Phanourios must always say: "God forgive the mother of Saint Phanourios." 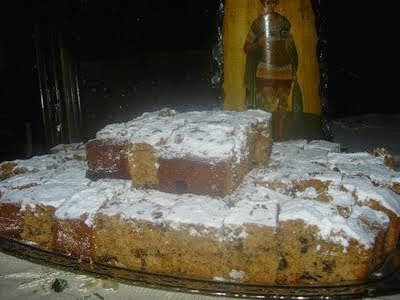 After the Phanouropita has been blessed by the priest in the church, the cake is distributed to the faithful in the church or in the neighborhood. One tradition says to distribute it to at least seven houses where someone bears the name "Mary" or "Maria". It is important that the ingredients always contain either 7 or 9 ingredients, since these are sacred numbers ever since the Pythagoreans. And as with all customs throughout Greece, there are variations of delivery. In Crete, Cyprus, Skiathos, Florina and other areas, the Phanouropita is made to find unmarried daughters a groom. Others believe that it brings good luck and illuminates the way of life of everyone. It is said that Saint Phanourios protects farmers revealing their stolen animals. So if you want Saint Phanourios to reveal something for you, bake a Phanouropita, have it blessed in the church, and wait for the results! Dissolve the baking soda into the orange juice. 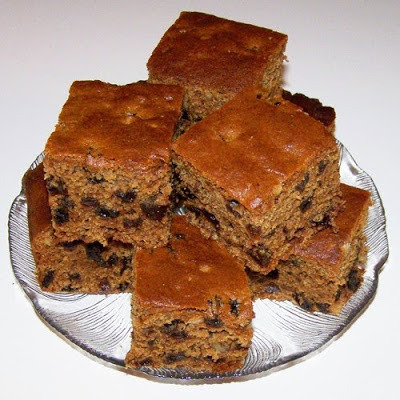 If you already have the raisins in the refrigerator you must put it 4 hours in water to swell. If they are fresh, use directly. In a bowl we put the flour along with the cloves, cinnamon, walnuts and raisins (which we patted dry to prevent flour clotting). Mix the mixture with a stirrer or spoon. No need to use the mixer again. We slightly lubricate the pan (number 28), because our mixture already has oil as needed to prevent sticking, and we spread the mixture. Put the pan in a preheated oven at 160-170 degrees, depending on the oven (it bakes in resistance and in air) for 40-60 minutes. Let the Phanouropita cool and then cut it. Mix well by hand the oil with the sugar and slowly add the remaining ingredients. Generally the cake does not swell too much but it is quite tasty. Beat the tahini with the sugar. In a bowl, add the juice, the peel and the water and beat well. Add the remaining ingredients to combine well. Put the mixture into a greased and floured pan (number 32). Once cooled sprinkle powdered sugar.